I’m sorry but it’s true – the traditional Thanksgiving meal consists of a lot of mushy nursery food – I’m talking about the stuffing and mashed potatoes and chestnut purée and cranberry sauce – it all reminds me of baby food! So over the years I’ve added the perfect crunchy roast potatoes – pinched from any British roast dinner and sautéed brussel sprouts with cranberries and pecans. However, of all the baby food on the Thanksgiving plate the sweet potatoes are a keeper. So American, so festive and just plain gorgeous, adding that much needed pop of orange amongst the 50 shades of brown of the meat and the stuffing. 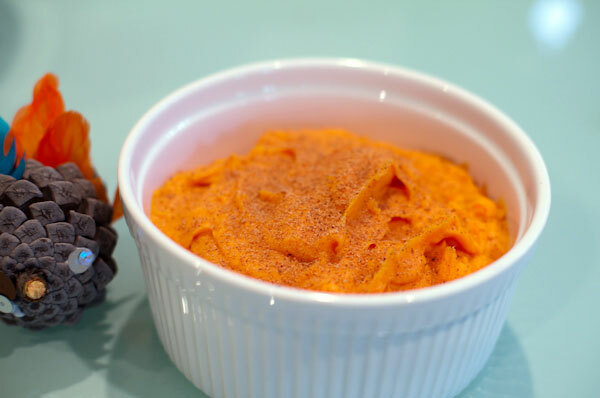 My go to recipe for sweet potato purée was taught to me by Martha Rose Schulman at her Thanksgiving without Tears class at the Venice Cooking School with Clifford Wright that I attended years ago. The yogurt makes it creamy without being too rich and the acid from the lime juice counter balances the sweetness from the sweet potatoes and apples. Oh and save the marshmallows for s’mores! 1. Preheat the oven to 425 degrees F and Line a baking sheet with foil. 2. 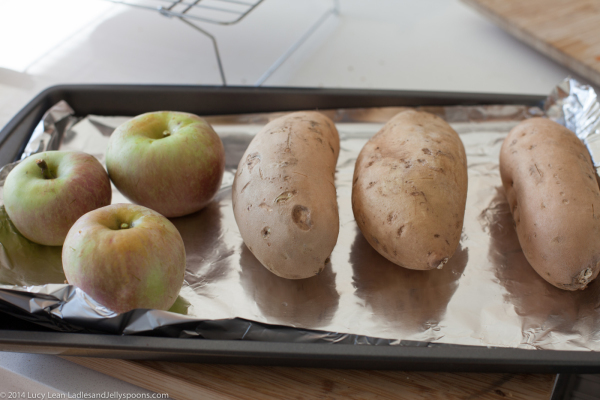 Using a sharp knife make holes in the sweet potatoes and apples and place on covered baking sheet. Bake for about 30 minutes for the apples, 45 minutes to an hour for the sweet potatoes – until they start to ouze and are soft. Remove from the heat and allow to cool. 3. Lower the oven to 350 F and butter a 2-quart baking dish. 4. Once the potatoes are cool enough to handle skin them, and peel and core the apples. Be sure to scrape off all the additional pulp off the skins. Cut the apples and potatoes into large pieces. Purée in the vitamix or a food processor fitted with the steel blade until smooth. 5. Add the lime juice, yogurt, melted butter, honey and blend together well. Season to taste with fleur de sel. Transfer to the buttered baking dish and bake in the oven until steaming, 20 to 30 minutes. Serve hot.